So, you’ve got a domain at another registrar and you want to transfer it to Porkbun. Let’s do it! Unlock your domain at your old registrar. Turn off WHOIS Privacy service for your domain at your old registrar. This service is sometimes called "private registration" or "protected registration." Grab an authorization code (aka EPP key) from your old registrar. This key is a one-use password that allows you to transfer your domain to another registrar, in this case Porkbun. Type in your domain to be transferred under Domain Name, then copy the authorization code from your old registrar and paste it into the Auth Code field. Hit Submit. The transfer or transfers will be added to your cart. From Your Cart, click "Continue to Billing" to pay for your transfers. Now that you’ve initiated the transfer, it can take up to five business days for it to complete. Some registrars will expedite transfers out if you contact their support department once the transfer is in process… but not all. You can check on the status of pending transfers by logging into your Porkbun account and clicking "Transfer" at the top left corner of the page. Here's an article that tells you what the different statuses mean. Depending on the domain you are transferring (such as a country-code domain), there may be additional email verification. In this case, you will want to make sure that your WHOIS contact information is up to date before you initiate the transfer. A Porkbun "transfer confirmation" email will be sent to your registrant email address. You will have to hit the confirm transfer link to initiate the transfer. You may also receive a similar email from your previous registrar. If your listed email address is inaccessible, update it. However, if you change your Organization name (or your First or Last name if there is no organization listed), some registrars prohibit transfers out for an additional 60 days. There's a few scenarios where you simply can't transfer a domain to Porkbun… or anywhere else. Was your domain first registered fewer than 60 days ago? If so, you’ll need to wait until the 60 day mark before transferring it to Porkbun. We feel your pain, but our hands are tied. Did your domain expire recently, or is it about to expire? Your old registrar has the right to prevent transfers of expired domains. 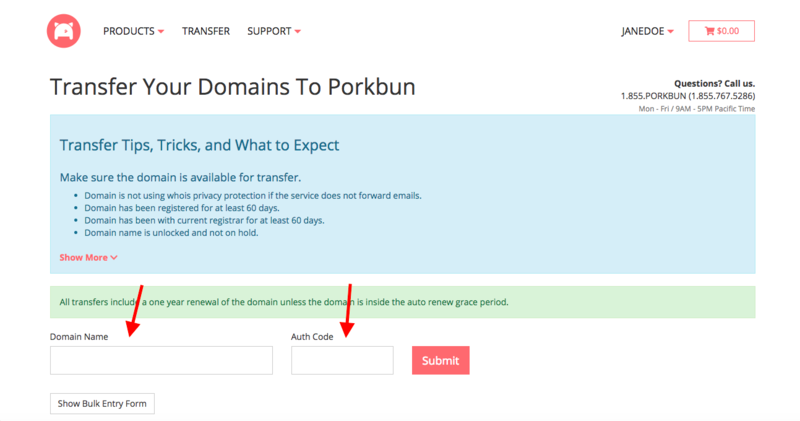 Additionally, if you renew an already-expired domain at your old registrar, then transfer the domain to Porkbun within 45 days, your registration may not be extended for an additional year. For more information, check out our guide "If I transfer a domain to Porkbun, will I lose any existing months or years of registration?"